Last weekend saw a couple of Midlands Puzzle Party folks meeting up at Birmingham Airport to catch a 6:00 AM (!) 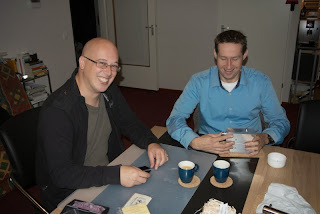 flight to Amsterdam – I met Nigel and Stephen at the airport at 5:00 AM (!) as agreed and it didn’t take too long to clear security, pick up a couple of British trinkets for the folks we were going to see and for the lad to head to Burger King for breakfast… I was glad that I’d had some Weetabix at home – not sure I could ever face Burger King at 5:00 AM, and I like Burger King! After a leisurely cup of coffee and a chat with the Coolen-clan, we headed off to The Hague with Louis, and Mieke and the kids headed off to watch the planes. The familiar train journey from the airport to Voorburg went by quickly and the hotel had rooms available for all of us to check in at 10:00AM. Bonus! Louis and I were sharing a room so we had a quick chat about some ideas (and a prototype!) he had for a potential exchange puzzle for 2014. We ended up playing around with it for quite a while (I’m slow!) and then experimenting with one or two tweaks and ideas before finding Stephen and Nigel waiting patiently in the lobby. 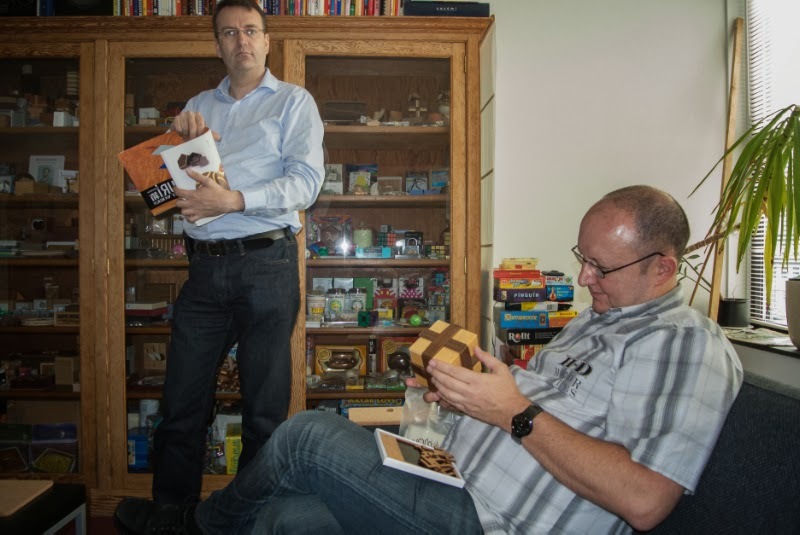 After a bit of a re-group we took a train out to Rijswijk to meet Rob Hegge who’d kindly invited us around for an afternoon’s puzzling again this year. As we were a bit earlier than intended, Rob met us at the station and we headed to the local shopping centre for some lunch al fresco, before walking back to his place for some serious puzzling. Soon enough we were joined by Chris Eggermont and Wil Strijbos, fresh from having set up Wil’s tables at the DCD venue, and Frans de Vreugd. 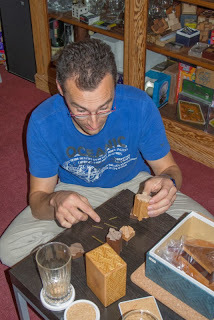 Rob had helpfully laid out a couple of Karakuri boxes that needed opening, including a couple which he’d been struggling with… and at least one of them remained firmly closed all afternoon – a Kamei parcel box with (apparently!) a single slider and a noise from inside that sounds a lot like a Dice Box, except there are no markings on the outside… so we were stumped! Frans had brought along my copy of his fabulous Cricket Box book, or rather, as James Dalgety had helpfully suggested, Cricket Cage book, seeing as how cricket boxes have another meaning entirely over here! It’s a fantastic piece of work and it’s pretty clear that this has been a labour of love – the photographs are superb – streets better than any of my pics on the blog and it’s also an excellent reference book covering all the known mechanisms out there, beautifully illustrated by photographs of as many samples as he was able to beg, borrow or … well, you know what I mean! 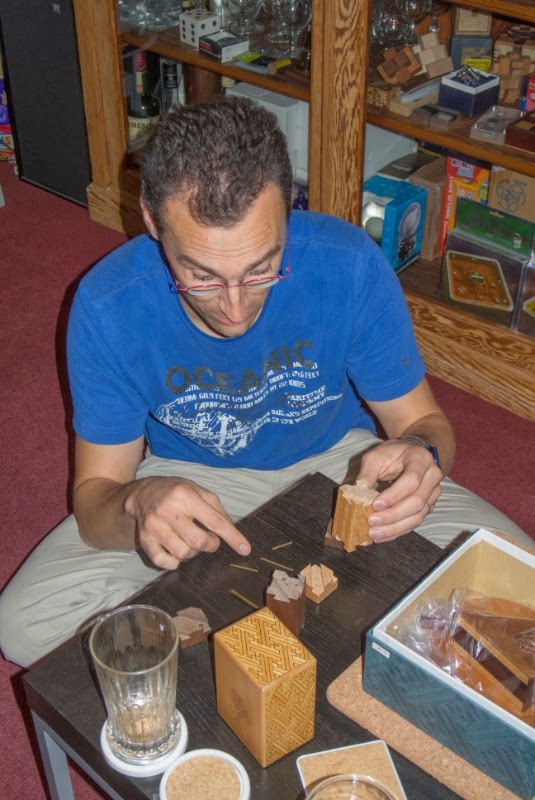 We ended up spending about 4 hours chatting and drinking Rob’s coffee while working through a prodigious array of puzzles … several Karakuri boxes were exercised and the Trapezoid Symmetry Puzzle was introduced to those who hadn’t seen it yet. Louis had a great time playing with a set of the Sandfield brothers’ Salt and Pepper shakers and had a huge grin when he got to the salt and pepper at the end. Frans began experimenting with Wil’s Angel Box and managed to find the first set of tools, but didn’t make a lot of progress after that. At about 6:00 PM we headed back to the hotel using a combination of Wil’s puzzle-mobile and a cab. We found Marcel enjoying a large stogie out in the rain while Goetz, Bernhard and Carlo were keeping a few of the bar stools warm. After a bit more puzzling chatter we headed into Voorburg on foot in search of the Italian restaurant we’d enjoyed last year, except this year Louis and I led the way to try and avoid a repeat of last year’s lap and a half of the town that Bernhard led us on… thankfully we found the restaurant right where we expected it to be, or we’d never have heard the end of it. The food was just as good as it was the year before and I enjoyed the lasagne and tiramisu immensely, and the puzzling and chat was pretty good too! 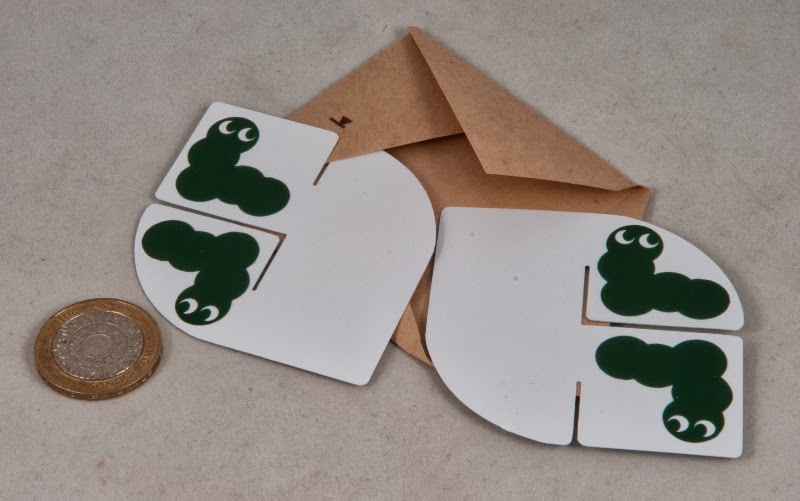 I’d taken along my copy of Triangle Eyes to terrorise folks and several tried but I don’t think anyone succeeded … one time I thought someone had and I tipped the pieces out in a hurry only for them to admit that one of the pieces wasn’t actually lying flat… it’s a killer puzzle! Back at the hotel there was more chat and puzzling in the hotel bar until it closed, and some time later we called it a night and crashed. 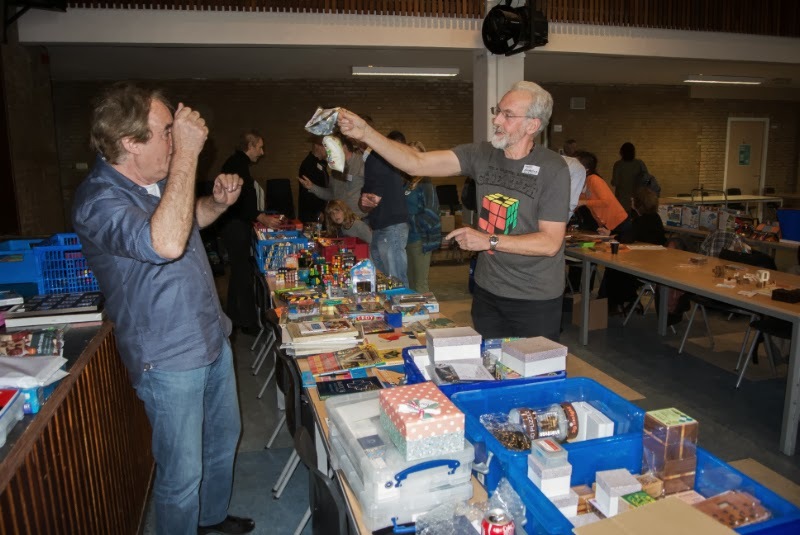 Fairly early on I made sure I’d had a chat with Michel van Ipenburg who was giving me a care package for Adin back in the Midlands … he’d brought along his set of Hexadecimal puzzles for folks to play with, including his fabulous eBay find of an original version in a mint condition box…. lovely stuff! Robrecht Louage was there again this year with copies of pretty much all of his recent designs for sale – I didn’t have a copy of his 2013 Design Competition entry Escape from Alcatraz, so I picked up a copy from him. 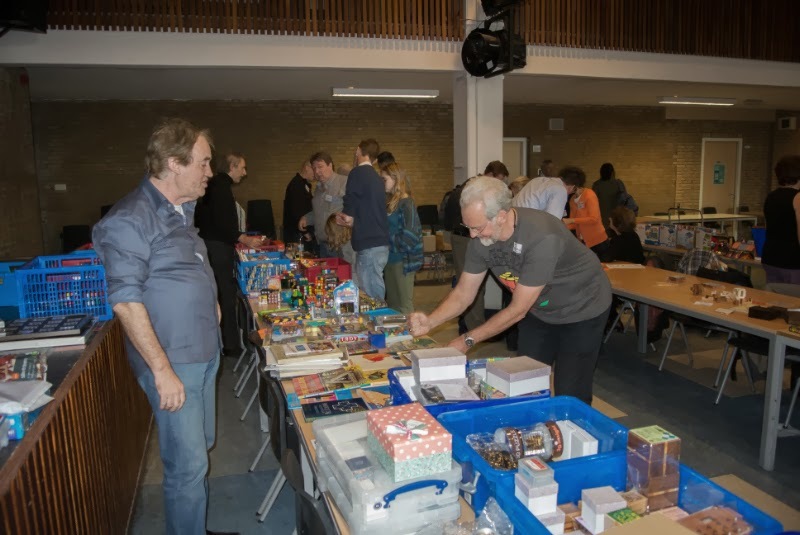 As usual Bernhard Schweitzer had a great selection of puzzles from the Pelikan guys as well as a number of individual copies of puzzles that were the last in stock at some serious bargain prices. I had a lovely chat with Jack Krijnen who had a small number of beautifully crafted little burrs for sale this year and I picked up a copy of his Elevenses II and Framed! Elevenses II is a 9-piece burr with a unique level-9 solution and Framed! is a gorgeous-looking eighteen piece padauk burr trapped in a zebrano cage – all to Jack’s fantastically high standards of craftsmanship – definitely brilliant finds! 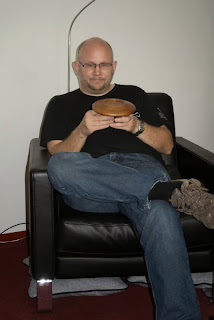 Jack had also brought along his personal copy of Goh Pitt Khiam’s Ternary Burr – while the shuttle and “ring pieces” look pretty standard, the surrounding cage consists of only two pieces and it’s pretty ergonomically shaped with rounded edges for comfort while playing / solving. The afternoon saw a bunch of excellent talks with Frans giving us an overview of his puzzle-hunting trip to Hong Kong and Japan (great pics and some good stories! ), Chris gave us some food for thought on using puzzles in education and challenged us all on what mathematics was really about. Goetz Schwandtner introduced his work on Chinese Ring-like puzzles and even managed to smuggle a couple of mathematical principles into his talk without losing the audience before Rob Hegge gave us a whistle-stop tour of the non-Japanese exchange puzzles from IPP33 (with a fair number of “contributions” – or rude remarks depending on where you were sitting! - from the audience when Rob wasn’t sure of a particular puzzle’s goal). I spent some time (and a little cash!) at Wil’s tables and picked up a few more of Mine’s packing puzzles that I hadn’t bought in Japan, along with a couple of variants of Kamei’s Expansion boxes – which between them take 85 moves to open – and one of them accounts for almost all of that! At one point Diniar shoved a few Gelenk Puzzles in my hand and said “For you and your friends”, so I kept a copy and managed to pass on the rest of them to some puzzling mates … spreading the joy around. Lunch was announced around the middle of the day and we all duly queued up for some excellent soup and sandwiches. There always seems to be plenty of food on offer, including the tea and coffee with biscuits and tarts on the go all day long, and it’s scrumptious. Vladimir Krasnoukhov had a bunch of new symmetry puzzles for a fiver each, so I grabbed a bunch of them – and I expect they’ll keep me fooled for absolute ages as I’m rubbish at recognising symmetry when it’s staring me in the face! The afternoon saw a special presentation to Rik van Grol for all of his contributions to NKC and DCD over the years – an amazing “Pavilion of the Giants” with a specially made burr or cube puzzle in each of the many little rooms and a checkerboard packing puzzle on the floors of each room – a serious labour of love beautifully crafted by Jan Zoon. Not only a beautiful object in its own right, but a fabulous collection of puzzles from the Soma Cube in the tower to some stupendously high-level 18-piece burrs below. A richly deserved tribute to someone who’s contributed so much himself. 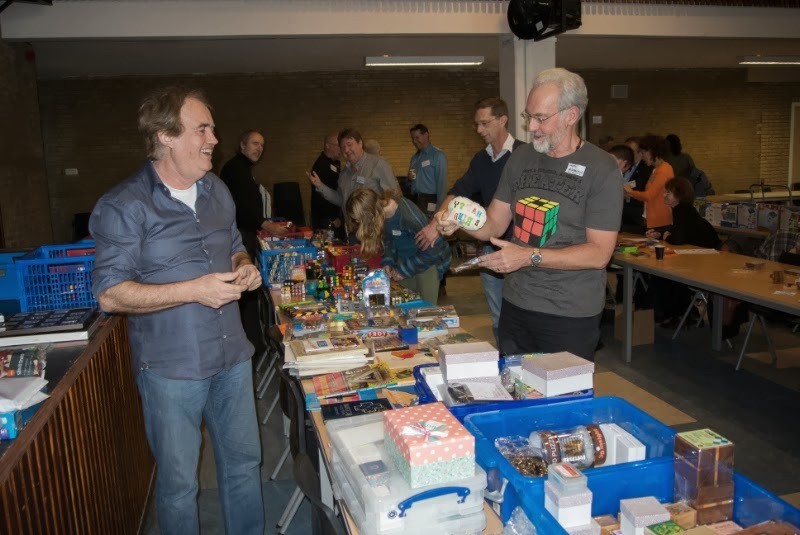 The bargain table of the day was definitely Jan Grashuis’ table where he was selling some of his collection of IPP exchange puzzles with everything priced at a fiver each… I picked up three exchange puzzles I didn’t have there and later found out that Taus, a fellow well-travelled MPP-er, had picked up at least a dozen little gems… making Nigel positively sick on the train back to the airport later that day when he saw what he’d missed out on. There was a classic comedy moment when Wil presented Laurie with his birthday present which he was instructed to thump on the table. 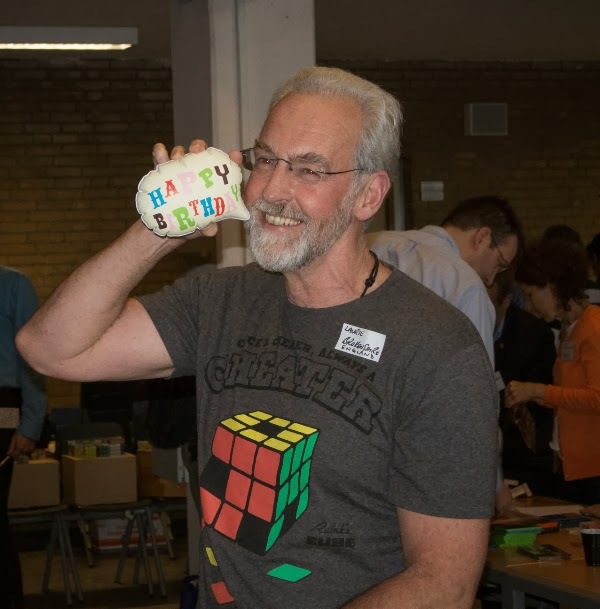 Laurie was a bit wary and gave it a half-hearted rap fearing the worst, only for not-a-lot to happen – duly chastised by Wil, he gave it a wallop and saw it inflate a little balloon with Happy Birthday printed on it… his relief was evident! As the afternoon began to wind down even us non-twisty-folk couldn’t resist watching the final few rounds of the speed-cubing competition –those guys are seriously amazing – how the heck they achieve that many moves per second is beyond me – let alone doing the moves that fast without the cubes flying apart – and actually solving the things at the same time – Respect. 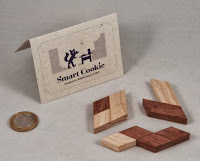 I hadn’t come across many of his puzzle designs before Washington, but I really enjoyed his entry into the Design Competition that year – so I was delighted when I found a bunch of his designs available for sale at Torito in Japan. First up is Kohfuh’s entry in last year’s Design Competition called “Chaplain”. Your task is to make the shape of a bowler hat with the four simple pieces provided. 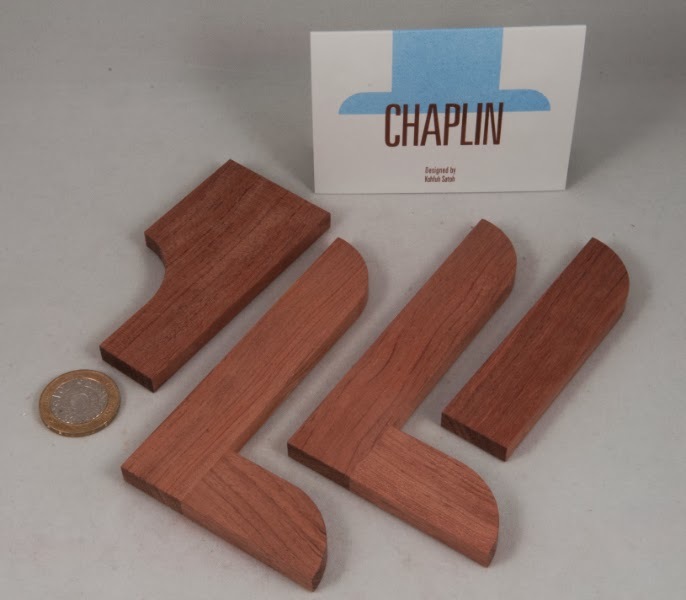 It’s not super-difficult as a puzzle, but I found it really satisfying – there’s a lovely little trap to sucker you into doing the wrong thing, but once you’ve avoided that, it shouldn’t take you too long to solve. “Rect” is a set of five light wooden quadrilaterals and a dark wooden square - your task is to make a solid rectangle with all of the pieces, and then remove the odd coloured square and repeat the process. One of the things I really like about Kohfuh’s puzzles are his packaging – he clearly puts a lot of effort into getting the packaging spot-on – this puzzle comes in a clear acrylic box, but he’s also included a Ziploc bag inside for keeping things together if you don’t hang onto the box … nice touch! 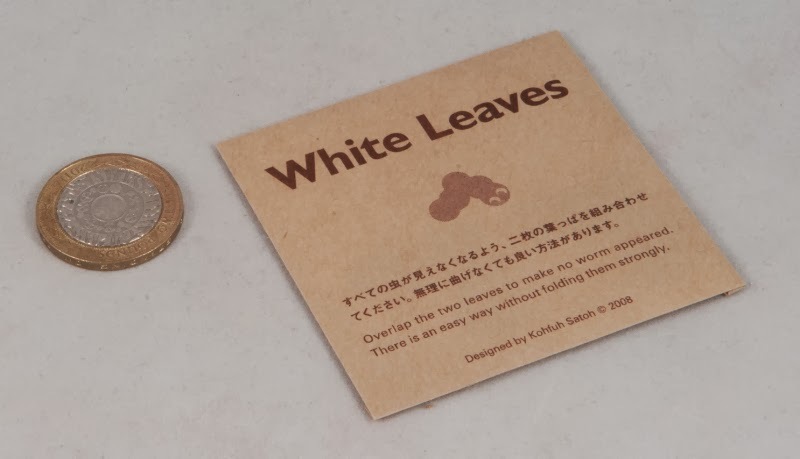 Speaking of packaging, I think “White Leaves” really deserves special mention. 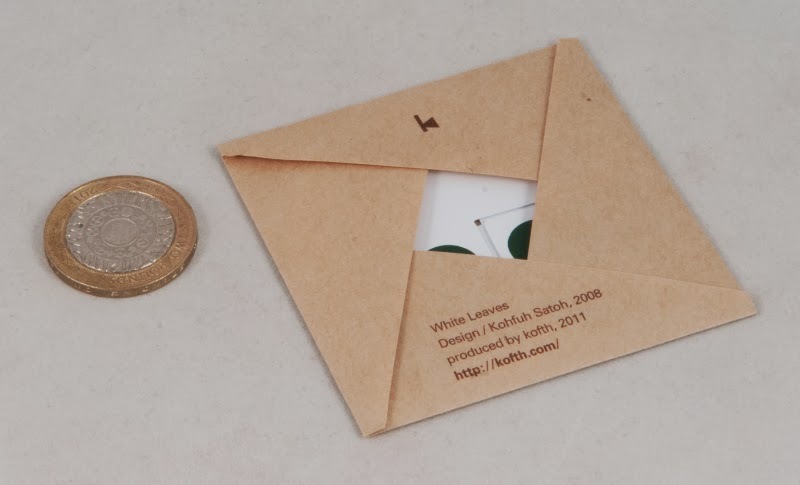 The packaging is elegant and simple – literally just a square sheet of paper with the plastic sheets inside at an offset angle with the corners then successively folded in on the package and the final corner tucked inside the first fold. I’m probably weird, but I think that the packaging is really clever! “Smart Cookie” is probably the toughest of these Kohfuh puzzles. 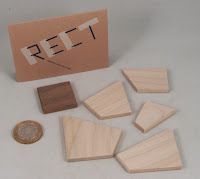 It consists of a set of three two-dimensional wooden pieces made up of rhombuses (rhombi?) in two colours. Your goal is to arrange the three pieces so that you have created the same shape in both light and dark woods at the same time. Mercifully the fronts and backs are the same colour which reduces the permutations a bit, although the shapes and less-than-orthogonal nature of the pieces makes it pretty darn elusive! So elusive in fact that I had gotten nowhere on it, despite several attempts and I’d probably still be working on it to this day if Louis hadn’t solved it on the breakfast table during his last visit … and having seen the answer, I’m not ashamed and not surprised I hadn’t solved it – it is cracker! The final puzzle in this group was Nick Baxter’s IPP33 Exchange Puzzle called “Fishy!”. It consists of a set of oddly (and differently) shaped acrylic fish (use your imagination!) 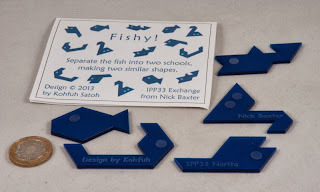 and you are asked to separate them into two schools of fish and then build a pair of similar (in the mathematical sense!) shapes with the two groups. When I first started playing with puzzle it’s fair to say that I had no strategy and no idea of where I might be heading – I just started experimenting randomly with fitting the little fishies together, and boy do they go together in a lot of different ways! I’d just about started to worry about how the heck I was going to recognise a pair of structures as being similar, when I noticed something interesting and followed it through to its natural conclusion – at which point I realised that it was going to be thoroughly obvious when this puzzle was solved – I like that about good puzzles!